Namibia is a country where the sky is clear and the visibility is good almost every day and all year round. It is also a country with a lot of tourists, long distances and more gravel roads than paved roads. It all sums up to a country perfect for flying smaller aircraft. Here are some of the ones I saw during my last visit at the coast. … a Cessna 208 Caravan belonging to Wilderness Air. V5-FOX also belongs to Wilderness Air (previously Sefofane Air Charters) that began operating 20 years ago with one aircraft based in Botswana but today operating over 50 aircraft in Botswana, Namibia, South Africa, Zambia and Zimbabwe. V5-Fox is one of many, many Cessna 210’s in Namibia. …that is a frequent guest in the ATC simulator exercises I have produced. V5-WJF is a Cessna 210 that belongs to “Wings over Africa” that started in 1998 with four aircraft and has since grown to a fleet of 22 aircraft. V5-BOY is another C210 with “Wings over Africa”. About to taxi for take-off is V5-JCC, a Cessna 210L Centurion II. 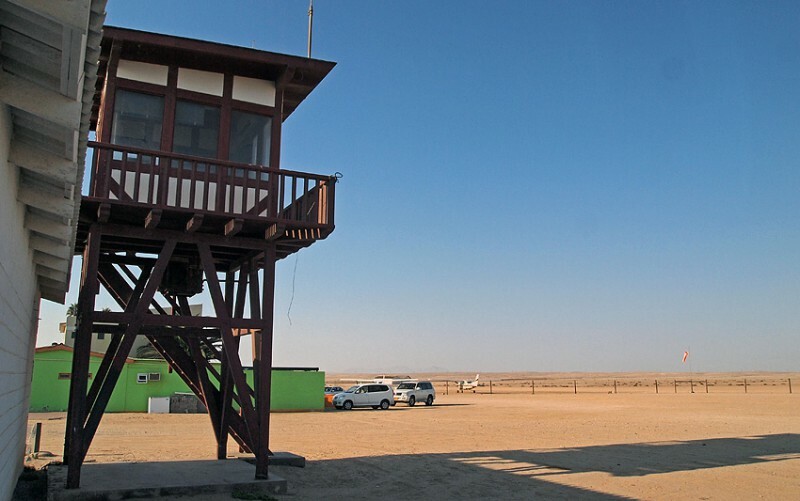 Above is the wooden tower of Swakopmund airport, less than 40 km north of Walvis Bay. Swakopmund is Namibias second busiest airport but the tower is not manned anymore. There are however plans to build a new tower and to man it. Swakopmund is the home base for many enterprises – scenic flights, skydiving and more. V5-LMK and V5-KPR here on Swakopmund airport are both Cessna 210’s belonging to “Nature Wings”, a joint venture between Nature Friends Safaris and Westair Wings Charters.